I grew up in an Italian home. What, you ask? With a name like Jones, fair skin and blue eyes. If you didn’t know me, you would never have guessed. My Italian roots come from my mother, she is a Naccarato, and my grandfather came over on the boat from Calabria. My genes favor my Dad’s heritage, but I am deeply rooted in my Italian culture. As a child, and to this day, Sunday is always pasta day. Every Italian family I know has a succo (sauce) recipe. They are all different, and have been passed down from generation to generation. The recipe isn’t written down, it never has been. You learn by watching, and helping. Once you learn, you continue the family tradition of making homemade sauce; I have been at it for decades. When my children were old enough, they were taught the family recipe as well. They will be responsible for teaching the next generation of our family. Once you have the perfect sauce, you need the perfect pasta. Sure, store bought will do, but there is nothing better than homemade pasta, and my favorite homemade pasta is potato gnocchi. This is another recipe passed down from Grandma. She did write the recipe down, but she doesn’t follow it, nor does she need it. I am blessed to have such wonderful family. Grandma taught me how to make her gnocchi. Saturday morning, I arrive at her house around nine. 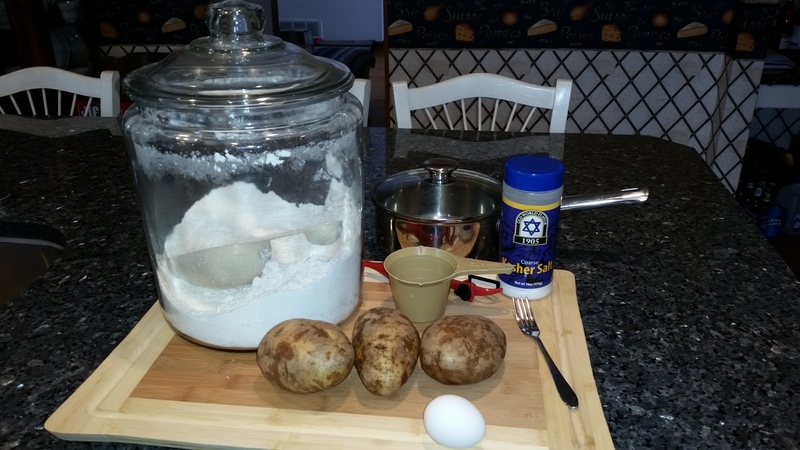 She has the potatoes out, along with the flour, egg, salt, pots, and pans. Her house smelled of fresh coffee brewing, and on the table a dish of homemade frizzalines (an Italian hard bread stick, great with butter), and a place set for me. She asked me to pour the coffee while she peeled and cubed the potatoes. It looked like I wouldn’t be helping much, nothing new for her, but I did write the recipe down, eat my frizzaline and drink my coffee as she worked. While we waited for the potatoes to cook, we talked. Nothing special, just to pass the time. Maybe a story of the old country, how she met Grandpap, her garden, food. It didn’t matter. It was about spending quality time. Once the dough was ready, I was given a piece to roll out and cut. That was big. The rolling and cutting, no problem. 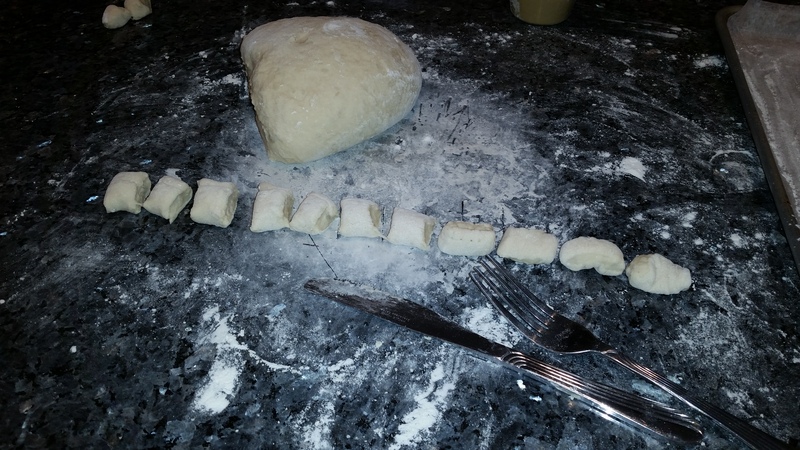 Then I had to use the fork to get the lines on the gnocchi. As you can imagine, I wasn’t very good. She never laughed. She patiently worked with me until I got it right. Then she handed me the gnocchi board. I wish I had that first. It would have been much easier. Her response, then you wouldn’t have learned our way. We got a few trays of gnocchi ready, they would be for Sunday supper. We cleaned up, and had another coffee with Grandpap, and talked some more. Before I left, she gave me food to take home, you never left her house empty handed, and reminded me, we were having gnocchi for Sunday supper at her house tomorrow. We went to church together as a family, and then went home to change. We were having Sunday supper at Grandma’s house, but that didn’t mean show up, eat, do dishes, and leave. We spent the day. My Aunt and her family were there as well, and the tables were set in the dining room, one for the adults and one for the kids. Some things never change, even when we grow up. The house smelled amazing, and the gnocchi that I helped make were being brought to the table. Yum. Gnocchi are one of my favorites. They have to be homemade, though. The bought ones are terrible. And there’s no better way to make them than with family (and frizalines). I couldn’t agree more. And I have often made them with leftover mashed potatoes. I am a master of the gnocchi fork! Maybe I can give you some tips. I remember making gnocchi with my great grandmother. She used to tell me stories about my great grandfather and yell at me for not paying attention and squishing the gnocchi. I miss living close enough to cook with her now, she’s got so much to teach. These days, I pray she will live long enough to see my children. Family time is important. What a great article. I felt as if I was back making pasta with my Nonna! You have it nailed exactly down to the feeling you got while watching her, sharing stories of the old country, and learning by doing. Oh how I miss those days. But I thank you Michele for bringing them back if only for a few minutes….. Yes, Krista, family is important. I am glad to visit and have quality time. And when family comes to visit from far away, I try to make their favorite meal, and dessert, and spend quality time with them. Karen, I am very fortunate to still have my grandmother, she will be 97 this year. I love going to her house to learn new recipes. She still doesn’t let me help much, but I learn a lot. And listening to her stories always warms my heart. I am glad my story brought back some fond memories. Although our backgrounds are pretty much the same, I never made pasta with my grandmother, not that I remember anyway! Although I did learn to make wedding soup with her. So I can relate to the wonderful memory of being guided to learn a family recipe. I have never made homemade gnocchi but looks like I can give it a shot! Enjoyed reading this and remembering my own memories! Glad this brought back good memories. Family is so important. I can’t wait for the day that I get to cook with my grandchildren. Hint, hint. Your story brought cooking with your Grandma to life. I wish I would have learned to cook with my grandma. Thank you Marcy. I am very fortunate. I grew up with both my maternal and paternal grandparents, and even had great grandparents to guide me. I wish more children could be as fortunate as I was. 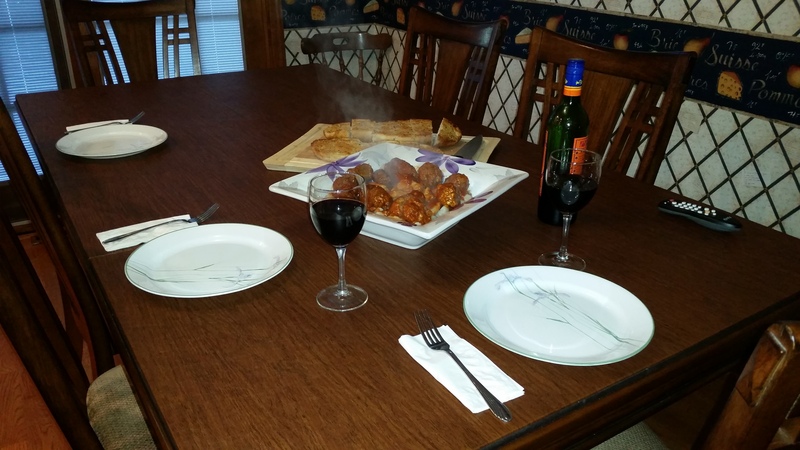 Wonderful Michele, thanks for sharing this recipe and the story. I also went to my Grandma’s when I was younger and learned to make these also. I unfortunately lost the recipe so I’m so glad to have it again. Like you said, she didn’t need it but I sat and wrote it down as she worked. Wonderful memories! Thank you, Sue. I’m glad this brought back good memories. I’m glad to share the recipe, and hope you enjoy making them.